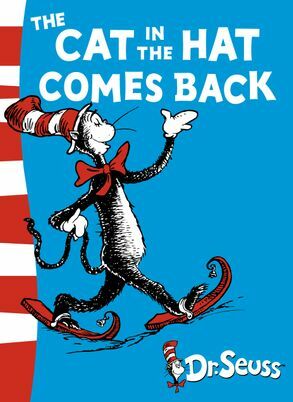 To accompany the release of the live action movie of The Cat in the Hat, starring Mike Myers, HarperCollins are proud to present Dr. Seuss's original tale of feline anarchy, pink snow and all-round mayhem! When the Cat in the Hat comes back, Sally and her brother know it's going to mean trouble. And guess what? They're right! The Cat in the Hat is one of the most popular characters in children's fiction, and this book is ideal for budding readers to tackle on their own. Theodor Seuss Geisel – better known to millions of his fans as Dr. Seuss – was born the son of a park superintendent in Springfield, Massachusetts, in 1904. After studying at Dartmouth College, New Hampshire, and later at Oxford University in England, he became a magazine humorist and cartoonist, and an advertising man. He soon turned his many talents to writing children’s books, and his first book – And To Think That I Saw It On Mulberry Street – was published in 1937. His greatest claim to fame was the one and only The Cat in the Hat, published in 1957, the first of a hugely successful range of early learning books known as Beginner Books.